Silv-O-Lite Hypereutectic 3.917 in. 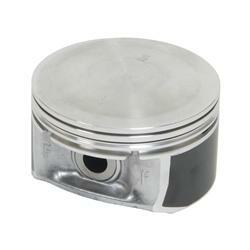 Pistons 03-up 5.7L Hemi Silv-O-Lite Hypereutectic 3.917 in. Pistons 03-up 5.7L Hemi, KB 3248HC-STD Hemi Pistons, 5.7L Hemi Hypereutectic Pistons, Hypereutectic 5.7L Hemi Pistons, Dodge Challenger Pistons, Dodge Charger Pistons, Dodge Magnum Pistons, Dodge Ram Pistons [KB 3248HC-STD Hemi Pistons] - $339.95 : 3rd Strike Performance, Your Source for Late Model MOPAR Performance Parts and Accessories! Get the most from your hard-earned dollars with Silv-O-Lite hypereutectic pistons. These pistons utilize aluminum alloy high in silicon for greater strength plus scuff and seizure resistance. Silv-O-Lite pistons have improved groove wear and resist cracking in the crown area where operating temperatures are severe. Silv-O-Lite hypereutectic pistons feature reinforced top lands and their proprietary process of diamond finished skirts. These aftermarket pistons are available for many applications from your light truck to your auto or import. Spend wisely and choose replacement pistons that will work hard for you--Silv-O-Lite hypereutectic pistons. Compression Height (in): 1.211 in. Dome Height (in): 0.158 in..
Pin Diameter (in): 0.945 in. Coated skirt. Shallow ring required.. Application Notes: Engine VIN code D. Replacement for original equipment number 05086011AB.